Jack Bisgrove, one of Auburn’s most prolific philanthropists, was remembered Monday, after he succumbed to cancer over the weekend, as a “visionary” who cared deeply about his community. John “Jack” Bisgrove, Jr., 79, was the former president and CEO of Red Star Express Lines, a national trucking company that started as a family business in Auburn in 1932. Before and after his retirement, Bisgrove dedicated himself to the betterment of the community, leveraging millions of dollars through a number of different organizations to support projects promoting childhood literacy, entrepreneurship, musical theater, local medicine and more. Along with his brother Jerry, Bisgrove was a co-founder of the Stardust Foundation of Central New York. Despite an initial plan to operate for only five years to provide $5 million, the charity lasted for nearly seven years and distributed over $12 million, according to Guy Cosentino, the foundation’s former executive director. Describing Bisgrove as “truly a visionary man,” Cosentino said part of why he was so successful as a philanthropist was his dedication to developing partnerships and building consensus between and within organizations. The foundation’s investment in Auburn Community Hospital to help retain a maternity ward was the perfect example of that ethos, Cosentino said. While many charitable foundations simply provide grants to recipients and walk away, Bisgrove would make sure the organizations were just as committed to succeeding as the foundation. “His take, and his brother’s take, was if you invest in people and projects, that meant the recipients would also be doing some of the heavy lifting,” Cosentino said. Besides helping keep the maternity ward, the Stardust Foundation had a number of landmark projects, including providing over 150,000 books to children in partnership with the Imagination Library, supporting the creation of the Cayuga Economic Development agency and helping the the Cayuga Community Fund. In addition to the Stardust Foundation, Bisgrove was a driving force behind the foundation of the economic development organization Locate Finger Lakes, led by former state Sen. Mike Nozzolio. “Jack lived an exemplary life. 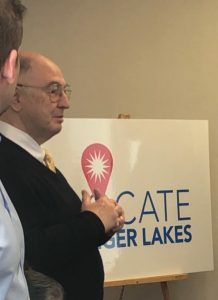 He cared deeply for his family, his faith and his community and there was no greater advocate for the Finger Lakes region, the area he proudly called home,” Nozzolio said in an email. One of Bisgrove’s biggest focuses, Cosentino said, was helping children. In addition to work with the maternity ward and the Imagination Library, Bisgrove played a critical role in Blueprint II, a youth leadership program, and Champions for Life, which promotes “Christian virtues and character through sports, recreational programs,” and more.